It doesn’t matter how experienced or not you are, but when you’re into sewing dresses, it’s a matter of time until you face the reality: you do need a dress form. Sure, some may raise an eyebrow, as they don’t really see the use of the dress form. We think that dress form is the best solution to preview how a garment is gonna look like when is worn as it simulates the exact drape and contour of the clothes on a body. This gives you the chance to take more accurate measurements, in order to make the right alterations. The market gives you plenty of options, and you may find both male and female molds, also known in this business as “James” and “Judy”. Before making the final decision, it’s better to scroll down to better understand what you should look for in the first place. What is the best dress form to buy? There are two main categories of dress forms: the standard one and the professional type. The standard dress form fits standard clothing sizes, whereas the professional one lets you display an impressive variety of garments and it’s customized to fit a specific person. It’s obvious that a standard dress form is cheaper than a professional one and you should know exactly why do you need it the first place. The variety of dress forms is tremendous and you may fins partially or fully pin able dress forms, torso-only dress forms with single or dual connectors and so on. If you are a dedicated designer, you should really get an adjustable dress form, typically with measurement dials for better adjustments on the critical points. You may need height adjustment, collapsible shoulders, and wheels- in a nutshell…The more adjustments and features, the better the dress form. No matter how we put it, we still see only one option: to get and use a dress form. Either it’s a cheap one or a sophisticated model, or even one handmade in your workshop, a dress form may be essential for the success of your design projects. Even though the Giantex Female Mannequin Torso Dress Form Display is great for display, it doesn’t mean you can’t use it for your designing, as long as you know its limits. The dress form is made with good materials. The polyester fabric looks nice, whereas the strong Styrofoam is reliable for displaying your dresses, garments. The rubber wood gives stability and a good lifespan to the dress form. The fabric is smooth and the torso section is lightweight. 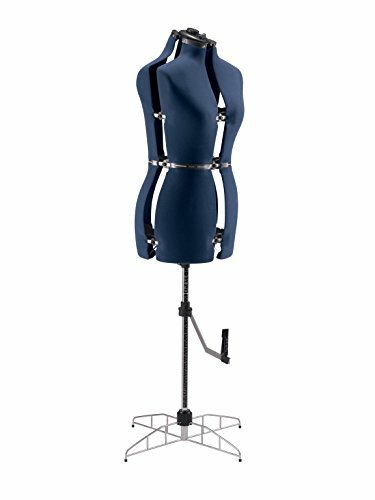 The dress form is easy to put together and you only need a couple of minutes to attach the mannequin torso to the tripod stand. You need to tools or screws for assembly. The dress form is lightweight so very easy to move around. The tripod stand is height adjustable and the dress form is nice to display your products in various places. The dress form is well made and looks quite sturdy and elegant in every shop. Despite the minor issues, when in need for a dress form to display your products or to work on some lightweight gowns, the dress form is a reliable choice. 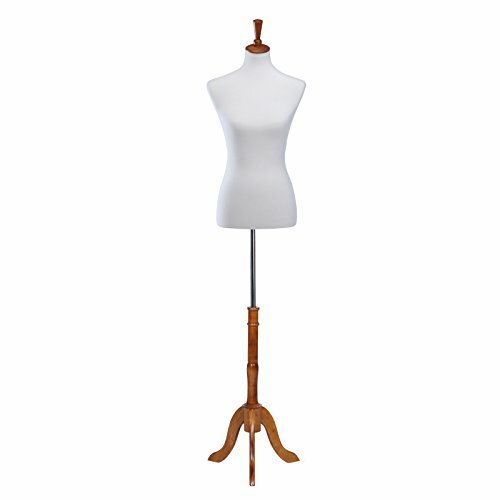 For the designer that wants an economy budget dress form, a reliable and versatile option is the Mannequin Dress Form Medium 6-8 Size 34″ 26″ 35″ Female Body Form. The dress form is actually eco-friendly as the torso is made with recyclable material and has no bad influence on the indoor air. The white jersey form is sturdly attached to the torso with no help from chemical glue, having no odor. The stability of the dress form is decent as it combines a wooden tripod stand and stainless steel tube. The dress form is long lasting and takes heavy weight garment, clothes, wedding gowns and even furnishing and decorative material. The height adjustability is something else to talk about the dress form. Its overall height is adjustable from 56” to 77” and you only need to follow instruction to do it. It’s easy to put together/ take down the dress form, the head is also easy to remove and the instruction that comes is very helpful. Lightweight, it’s also very easy to carry around the dress form when in need. The torso area is very well built and the dress for presents a great figure, with bust and curves. The medium and large shirts fit very well. 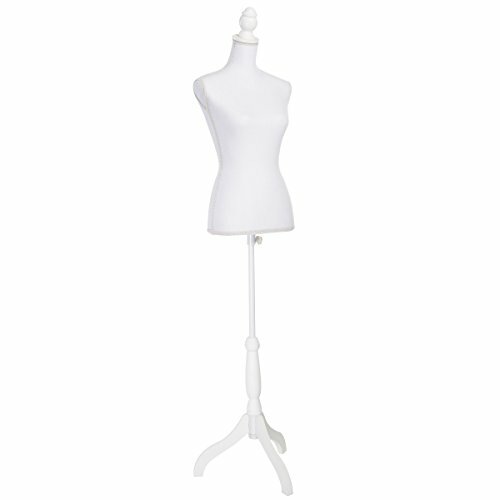 The mannequin looks nice and is great to use for display, decorating it with scarfs, clothes, various garment items. It presents good quality and it’s a great asset for your designing projects. Despite the minor issues, for the quality of materials and its nice appearance, the dress form is a sure buy when in need. 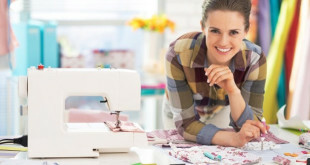 If you are a home seamstress that wants to take its designing projects to the next level, a good asset to do that is the Dritz Sew You Dress Form. The dress form is highly adjustable and its versatility is so helpful when working on various projects. It presents 9 adjusting wheels at bust, waist and hips, but also 2 auto-set dials for the bust and waist. The list of adjustability doesn’t stop here and the dress form comes also an adjustable neck with pincushion. You may also set it for the height you need in a specific project as the dress form presents also an adjustable height. The dress form comes with pin hem marker, which is so good to have. The cover is made with foam-backed nylon so it’s easier for your to pin and mark. Its opal green color looks nice and original as well. The dress form is easy to put together and to carry around as it’s lightweight. It’s very easy to use and its color and material makes it easy and fun to mark and pin when working on a project. The dress form spins easily and is so dependable for any home seamstress. Nevertheless, for its high adjustability and versatility, the dress form is a great tool that any seamstress ought to have. 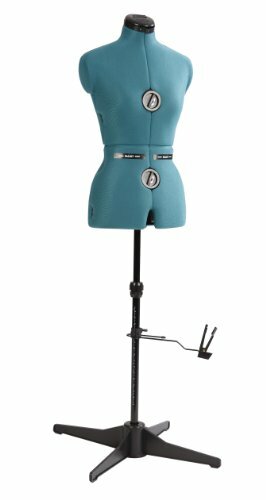 The more you’re willing to pay for your dress form, the more you get and the Singer DF250 Adjustable Dress Form brings to the table plenty of good features and has only some minor flaws attached to it. The dress form presents a 100% flannel so it’s easy to mark and pin on your projects. It impresses with its adjustability and it gives you no less than 13 key adjustments (bust, hips, waist, and neck/back). You get better options and more chances to find the right setting for many projects that you’re working on. You may also adjust the height of the dress form so it’s easy to set the right height. Additionally, you don’t need any tools to find adjust the height. The foam-backed fabric cover looks nice and it’s easy to pin dresses, skirts or various patterns. The dress form presents good stability thanks to the four leg metal base that leaves a durability feel as well. The list of good features continues with the pincushion with a key holder so that it’s very comfortable for you to organize and store the pins and adjustment key. We also notice the 360-degree Hem guide that helps you better pin/mark garments for hems or various alterations. The dress form looks durable, well made and its vibrant blue color really makes a nice impression. Lightweight and easy to adjust, the dress form is a dependable choice for any avid seamstress. No matter the minor issues, for the high adjustability, nice looks and reliability, the dress form is a good investment of your money anytime. 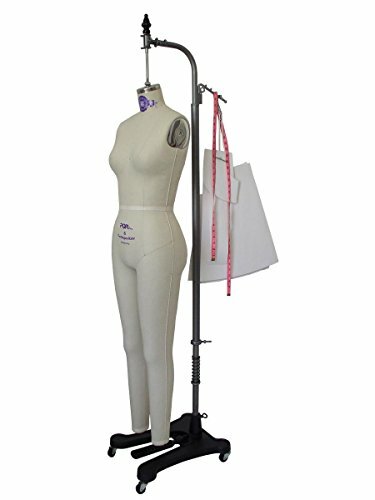 When your skills and interests are all passed the entry level, you can finally get the perfection you’re looking for on your designing projects, getting some help from a professional dress form like the Female Professional Dress Form with Collapsible Shoulders. The dress form is very helpful for sewing, designing and dress making and is there to help for a very long time. The dress form comes with a wire basket like extension under form and is made with high quality materials. It’s easy to put together and features collapsible shoulders, becoming more versatile and reliable for various projects. The shoulders may be collapses and expanded for more flexibility. This way it’s easier to use with tighter fitting clothing. The adjustability of the dress form is great and you may also lower/raise the torso on the base, by pressing your foot down on the base pedal, while lowering/raising the torso. The dress form presents a canvas cover so it has an elegant, beautiful appearance. The cover is long lasting and is ready to take some heavy duty pinning. The base is also heavy duty and the cast iron gives great stability to the dress form. The height is adjustable, using the base pedal and the dress form takes the heavy weight gowns. The setup is easy and the dress form is very well made. it’s easy to install it and has a sturdy feel attached to it. You can pin it in any angle, for a very long time. Despite its solid built, the dress form is easy to move around. The cage underneath is easy to remove when in need. The downsides aren’t deal breakers for us and we like the dress form for its adjustability, collapsible shoulders and ability to take the heavy duty pinning, for quite some time. You only need to take a quick look at the SINGER 12-Dial Fabric-Backed Large Adjustable Dress Form in order to understand its popularity. The adjustability of the dress form is impressive to say the least and you only need the patience to make all the adjustments you need for a specific designing project. The dress form comes with adjustments for neck and 12 adjustment dials for the body contour. 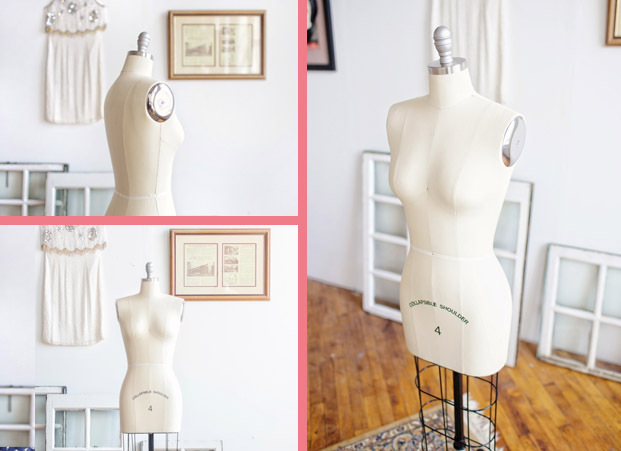 The dress form lets you adjust the working height, the bust, the torso height and also the waist. If you want to be even more precise, don’t hesitate to adjust also the hips. The dress form presents a hem gauge and a basting attachment, so helpful when designing and sewing. The hem marker is an important detail and only the experienced seamstress appreciates it truly. The foam-backed fabric cover lets you pin it over and over again, for dresses, skirts or other patterns. The dress form needs basic assembly, but you don’t need any tools for it. It comes with an instruction book, which is easy to follow. We find the dress form to be rather lightweight and easy to move around. It’s very well made and is very easy to use. It’s rust resistant and gives great results. Let’s not forget its nice red color, which makes it pop in every window shop. No matter the minor issues, for its high adjustability and reliability, the dress form is a nice looking asset for any respected designer shop. 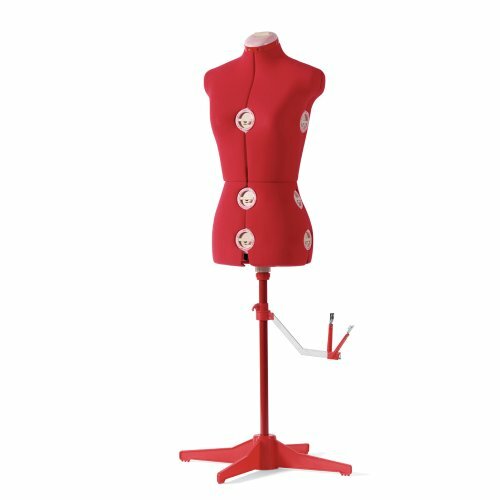 The experienced and professional seamstress and designer may find the Professional Missy Female Full Body Dress Form Tailor Dummy Mannequin Collapsible Shoulders a very wise investment for their business. The dress form comes in various sizes and presents plenty of features and amazing built that recommend it any given day. Going through the details, we see the collapsible shoulders and also that natural looking buttock. Its cover is made of linen and is 100% side-pin-able. The protruding side seams help you when draping, guiding you for better accuracy. The padded fiberglass core is high quality and has a durability feel to it. The heavy-duty traditional cast iron base gives amazing stability and has a sturdy appearance. It features 4 wheels that fit the durable base. The dress form becomes highly portable and it’s very easy to move around. The natural body shaped dress form presents a buttock that has a realistic look. The height is also easy to adjust and you only need to step on a foot pedal. The dress form is very well made and is great for draping and designing. It has good quality materials and it’s easy to pin. It’s easy to work on it and everything about it says “long lasting”. The dress form comes very well wrapped. You may also use it for display. The minor issues don’t hold us back from considering the dress form as a great asset for any professional seamstress/designer.